Motor Marc’s featured painting for the 77th Sturgis rally 2017 and the first piece of art from his new series. It’s an early start at the motor boys club, hard work and all play. Finding old car parts, motorcycles and anything to add to their collection. No matter the size of the load, the kids come together to overcome any obstacle in collecting their treasure. From the vintage Harley Davidson, to skull and cross bone flags waving in the air. Motor Marc recreated his childhood clubhouse using old memories as inspiration. 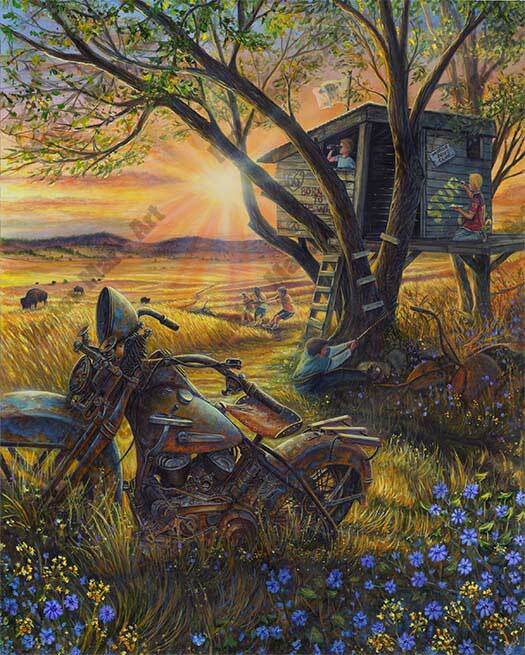 Motor boys club is captured in this painting using the fields of South Dakota as the perfect backdrop for lasting memories.